Paris is building the eco-community of the future right now. Here’s how. 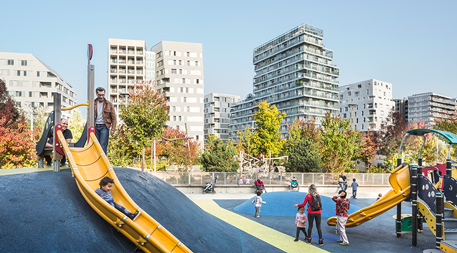 The Clichy-Batignolles eco-district aims to set a new standard in sustainable urban design. 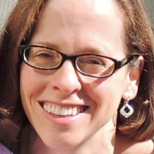 May 23, 2018 — Every so often an environmentally friendly building gives us a glimpse of the low-carbon future so many climate plans envision. With the development of Clichy-Batignolles, the city of Paris has created a groundbreaking eco-village filled with such buildings. Begun in 2002, the massive redevelopment project is about 30 percent complete and is slated to be finished in 2020. In 2007, Paris became one of the first municipalities in the world to adopt a climate action plan, setting goals for greenhouse gas emission reductions above and beyond those outlined by the European Union. 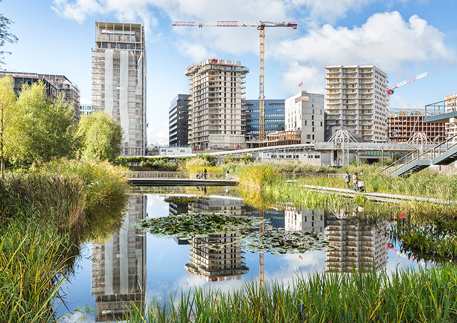 Employing virtually all the tools in the green builders’ toolkit, Clichy-Batignolles aims to be tangible evidence of the city’s commitment to reducing its carbon footprint as well as an experimental laboratory for testing what’s possible in climate-sensitive redevelopment. What used to be a train yard is being turned into an urban park surrounded by energy-efficient buildings that will house 7,500 residents and provide places of employment for more than 12,000 people. Clichy-Batignolles’ naturally landscaped park and eclectic modern architecture contrasts sharply with historic Paris. But what makes Clichy-Batignolles most significant cannot be seen with the naked eye. The complex planning process it pioneered involving disparate stakeholders working in concert to maximize building efficiency and minimize resource use offers other cities a road map to achieve a low-carbon future. The development’s contribution to sustainable urban design was recognized in 2016, when it won the Sustainable City Grand Prize in the international Green City Solutions Awards competition. According to a brochure for the project, the City of Paris sought to make Clichy-Batignolles “a model for sustainable urban development.” Architects, urban design experts, government officials and environmental engineers worked together for years to plan the project, and the project’s design team was charged with incorporating as many best practices in contemporary green design as possible. Nicolas Rougé, a consultant in sustainable urban planning who has been with the project in a number of roles since 2008, says this mandate drove those involved to experiment with technologies in ways they hadn’t before in order to meet ambitious goals. 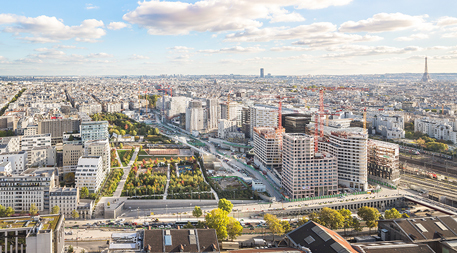 To keep building footprints as small as possible while maximizing usable space, Clichy-Batignolles developers sought and won permission to exceed Paris’s longstanding height limit of 37 meters (120 feet). When the project is complete, 10 buildings will stand at 50 meters (160 feet), while the new Palace of Justice by renowned architect Renzo Piano soars to 160 meters (520 feet). 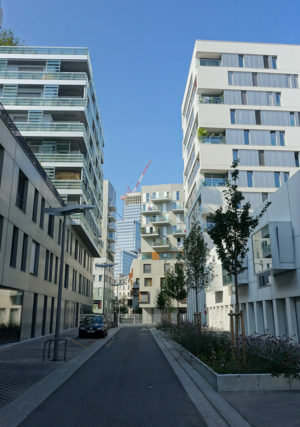 Overseen by a public company owned by the City of Paris, developers at Clichy-Batignolles must follow extremely strict guidelines for building energy consumption. For heating, energy use cannot exceed 15 kWh per square meter (11 square feet), the aggressive limit set by Passivhaus building standards. Buildings maximize use of insulation and high-performance window glazing, and they are oriented toward the sun to capitalize on natural heat and light. Many use high-density materials that capture and release solar heat to aid in heating and cooling. Mireille Fenwick, a resident of the eco-district, says her apartment is so well insulated that in the three years she’s been there, she’s turned on her heat only a few times. Considering that heat accounts for a substantial proportion of residential energy use, that savings is significant. Some energy-efficient measures offer other benefits, too. A number of buildings have green roofs that offer not only insulation, but also garden space for residents and habitat for wildlife. One building housing an elementary school has walls covered with plants that both insulate the building and add biodiversity. Much of the district’s heat and electricity comes from renewable sources, rare in Paris today. The development innovated the use of a neighborhood-scale geothermal heating system that taps into a warm water table beneath the park, drastically reducing energy needed for heating. Some buildings use heat from outgoing graywater (water drained from sinks, tubs and washing machines ) to heat incoming tapwater, saving 58 percent of the energy typically required for water heating. Wherever possible, developers have installed solar panels on roofs and facades. More than 35,000 square meters (380,000 square feet) of panels will generate 3,500 MWh per year, roughly 40 percent of the electricity used in the development. To cut carbon emissions further, the layout of the development encourages walking and use of mass transit while limiting space for cars. Roadways are restricted to 12 percent of the total surface area, and low speed limits prevail, which helps privilege pedestrians over cars. To further improve air quality in the district, deliveries are restricted to a fleet of electric vehicles that cover the last kilometer (0.6 mile) from a central drop-off site. In addition to retail and office space, the district encompasses a wide range of housing and services, including four schools, medical services, daycare facilities, gyms and an activity center for teens with performing arts spaces and a practice kitchen. The historic Odéon theater has a venue there, and a multiscreen cinema and community gathering place will open soon. The development’s residential units include housing for buyers with a range of incomes, as well as capped-rent units. Different sizes of apartments meet the needs of families, couples and those who live alone. Some buildings are designated for students, while another houses a nursing home. Other innovative measures minimize Clichy-Batignolles’s climate impact. A system of pneumatic tubes beneath the development collects trash and recycling, reducing traffic and cutting the greenhouse gases associated with waste disposal by an estimated 42 percent. Recyclables are sorted, then shipped using an adjacent railway. Nonrecyclable waste goes to the Saint-Ouen incineration facility, which burns trash to produce heat and electricity. The buildings encircle the 10-hectare (25-acre) Martin Luther King Park, which provides a recreation area in a part of Paris especially lacking in green space. In addition to being a pleasant space to play, the park is a key element of the development’s climate adaptation strategy. Its trees, plants and water features help lower the air temperature on hot summer days. Permeable surfaces allow water to soak into the ground, and an underground tank collects rainwater for irrigation to minimize water use. A pond provides habitat for waterfowl and other wildlife,and also cools the surrounding area as water evaporates. To support Paris’s Biodiversity Plan, nearly 500 plant species have been planted in the park. An additional 6,500 square meters (70,000 square feet) of private green space and 16,000 square meters (170,000 square feet) of green roofs offer further opportunities for outdoor recreation, wildlife habitat, cooling and rainwater infiltration, while two community gardens give residents places to grow their own food and compost food waste. Emmanuel Demange, who moved into Clichy-Batignolles two years ago, chose the location in large part because he wanted “to overlook a large green space like Martin Luther King Park.” One of the highlights of living there, he says, is his proximity to the park’s “biodiversity, its fauna, its flora,” a refreshing antidote to urban life. Rougé is part of a team working to address this gap with a coordinated project called CoResponsibility in District Energy Efficiency & Sustainability (CoRDEES), which was recently awarded €4.3 million by the European Union’s Urban Innovative Actions Initiative to develop smart-grid technology aimed at bringing real-time energy use in line with Paris’s ambitious targets. 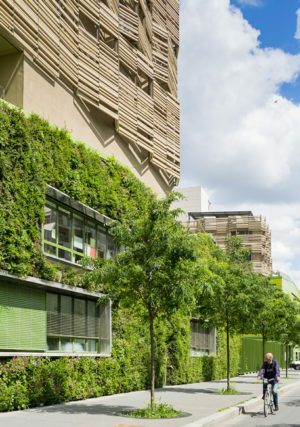 The community-based model aims to enlist end users to help monitor and manage energy at Clichy-Batignolles to ensure that buildings achieve the carbon dioxide reductions they were designed to. With Clichy-Batignolles, Paris has demonstrated the capabilities of many existing tools to build carbon-neutral cities. By putting so many green building technologies to work in one place, the city has provided a working model of a low-carbon community for other cities around the world. I saw not a single mention of room cooling in the summers...is there no air conditioning in this project? It's passivhaus which means it's superinsulated, with about 10% of the usual cooling/heating load, which is probably achieved via the HRV or ERV (Heat recovery ventilator or energy recovery ventilator) alone and/or perhaps a very small heat pump. I can't help but think of the Bijlmemeer in the Netherlands. I hope this works out better! The newly built area of Clichy Batignolles is rather affluent. The prices of the apartments are consistent with Paris prices and have increased substantially since its inception. Like in the rest of Paris, there are rent-controlled apartments but most apartments are privately owned residences owned by professionals and business owners. As the owner of a flat in the first new building of the new neighborhood, I have seen this area grow in charm due to its proximity to the village like atmosphere of Batignolles and in popularity due to the young, new businesses and restaurants which have opened. It's a great place to live.